Carlton Ware were introduced a range of Crinoline Ladies in the 1930s, either as individual figurines, figurines with a Bell or as Napkin Holders and even as a Cruet Set. This design was very popular at the time, representing the Victorian age of excessive style and glamour for the women of the era. 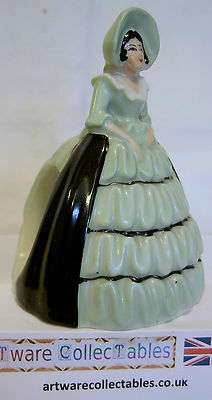 This figurine is designed as a Napkin Holder, with the lady having a medium green dress and black sashes down the sides with further black stripes around the lower body of the dress. It stands 4 inches (10 cms) tall and is in excellent condition .